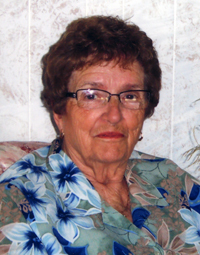 Peacefully at the St. Claude Health Centre on Wednesday, August 22, 2018, Mrs. Francine Marion of St. Claude, Manitoba passed away at the age of 95 years, 2 days short of her 96 birthday. She leaves to mourn her passing four children, Pauline (Roland Rouire) of St. Claude, Anita (Ron Baschuk) of Flin Flon, Simone (Roger Badiou) of Leduc, Alberta, Denise (Randy Fox) of Oakville; nine grandchildren, Guy (Lise), Mona (Bryan), Chris (Shelley), Stephen (Paige), Kevin (Brittany), Michelle, Pat (Stacey), Shelley (Keir) and Greg (Sam); 14 great-grandchildren, Stephane (Kaitlin), Maxime (Mack), James, Bryce (Chantal), Tyler, Sam, Lianne, Danica, Nathan, Fox, Dylan, Brody, Nicolas and Parker; one sister Marie-Rose de Rocquigny; and numerous nieces, nephews, relatives and friends. She was predeceased by her beloved husband Paul Marion in 2004, and by one great-grandson Braden in 2016. Funeral services will be held in the St. Claude Roman Catholic Church on Tuesday, August 28, 2018. Eulogy and music at 1:30, followed by the Funeral Service at 2 p.m. with Father Armand LeGal officiating. Interment to follow in the Parish Cemetery. In lieu of flowers, donations may be made to the St. Claude Health Foundation/ Palliative Care, Box 400, St. Claude, MB R0G 1Z0.